Like many moms, my most productive place to stand is at the intersection of Clean and Organized. I operate at my peak capacity when all of my life plays like a symphony of order. 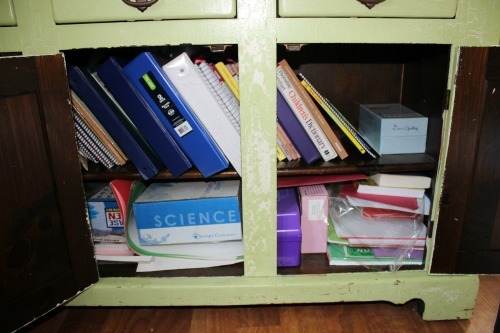 Naturally, my homeschool days go so much smoother when everything has a place and everything is in its place. No matter. I'm content with scruffy hospitality. Summer, with its carefree days and its emptier schedule, always provides ample opportunity to reorder and realign. 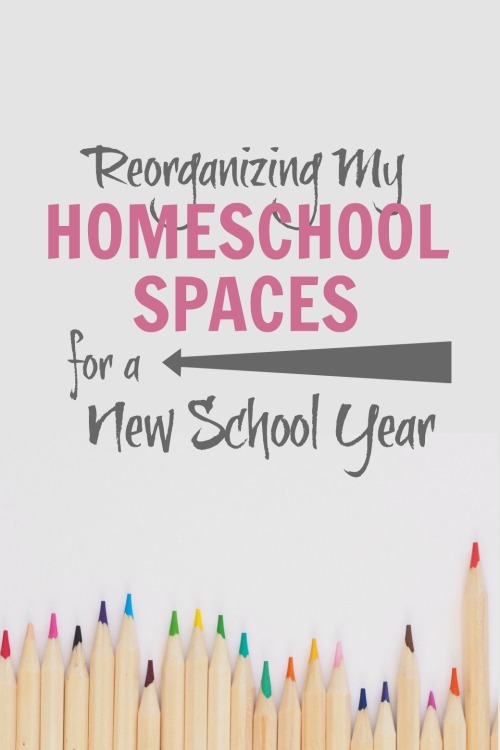 By carving out one or two mornings to deep clean our learning cupboards, I can march tall into the new school year knowing that last spring's disheveled homeschool spaces are once again fall-ready. They are organized...if only for a moment. 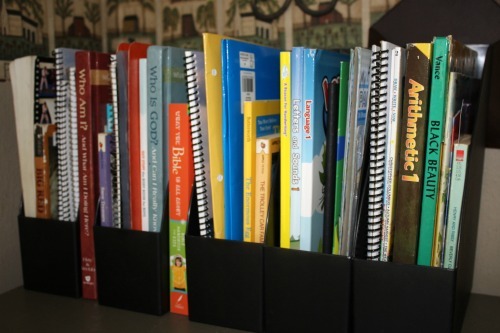 This past week I hunkered down for the annual binge-and-purge...one of ten steps I do every summer in order to prepare for the coming school year. 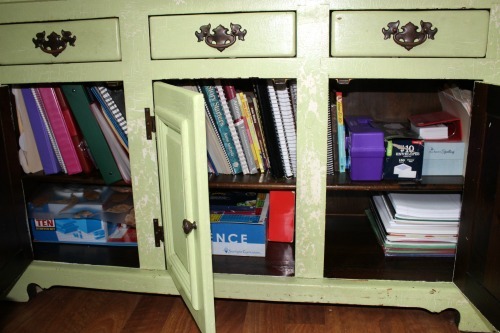 Here's a peek at my main school hutch BEFORE I cleaned it. You'll notice that it was a jumbled mess of confusion. 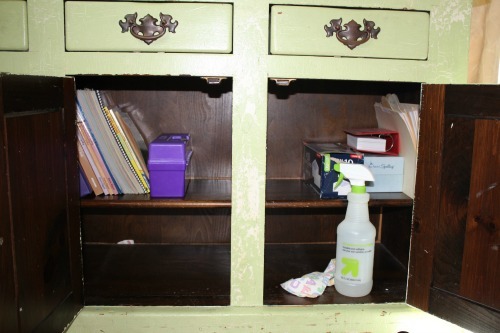 My mission was to clean out any materials that would not be needed next year, replenish and pack-in any new items we'd be using in the coming months, and give the whole cabinet a deep dusting. After a shelf was emptied and sorted, I scrubbed it clean and moved on to another shelf. 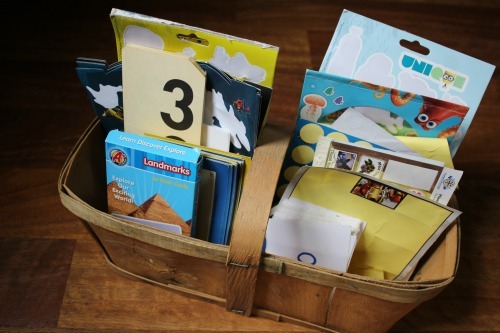 Then it was time to tackle other school storage spaces around the house, like our start-the-day-together basket, our TruthQuest bin, and our flashcard basket. I sorted through the items of each of these by placing the materials in the same six piles as before. By this time, my six sorted piles had grown quite large and needed some attention. Items were thrown away, returned, and reorganized. 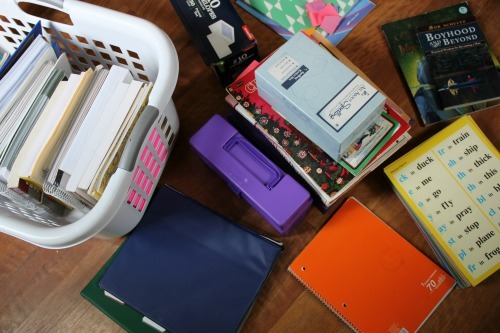 The materials that I had placed in the laundry basket--the ones that I knew I would not need for next year but that I would need again someday--were brought to the basement where I keep all our not-currently-in-use homeschool curriculum. 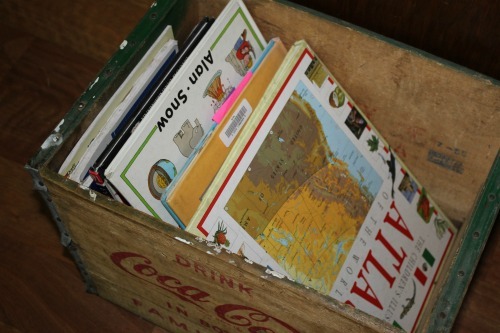 They were all organized by grade level and/or subject and were slid spine-side-up in between other similar books in a large filing cabinet that we use for long-term curriculum storage. 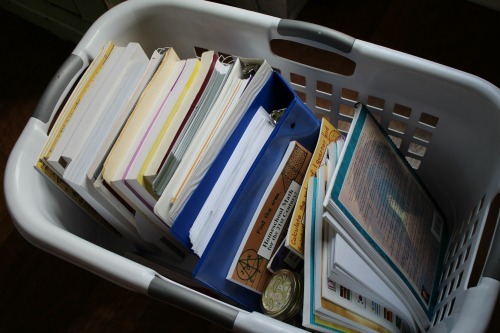 Before leaving the filing cabinet, I culled next year's books and placed them all in the empty laundry basket to be brought upstairs. Back in the dining room, I refilled the main school cabinet with all of next year's teacher materials--instructor's guides, lesson books, and project kits. Here's a peek at what it looked like AFTER it was officially deep cleaned. Next, I filled the kids' individual school bins with their personal workbooks, notebooks, and reading books that they'll need for the upcoming school year and put the empty laundry basket away. 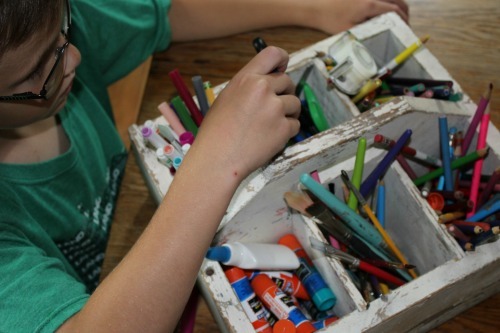 At this point, I enlisted the help of my kids to clean out the individual drawers of the school cupboard and our main supply caddy which holds items like pens/pencils, markers, and everyday art supplies. 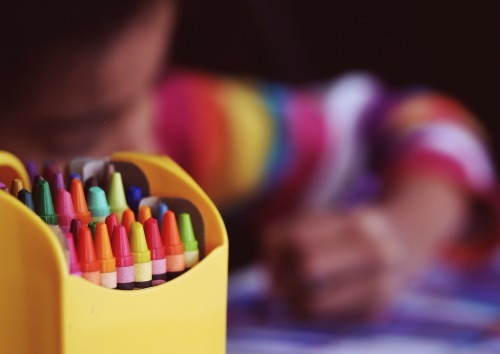 (Our more elaborate art items like acrylic paints, chalk pastels, and glue guns are stored elsewhere.) The kids sorted, cleaned, and tested everything to make sure all the supplies were in good working order. 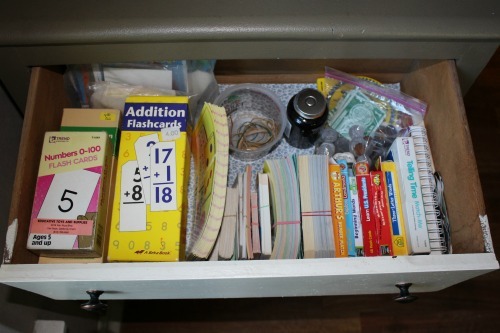 Here's what the manipulatives drawer looked like BEFORE I got my hands on it. As I cleaned it out, I used a similar pile system to the one I used while cleaning out the main cupboard. Once I got the drawers sorted, I assigned each child to reorder one set of flashcards until all the card sets were in their proper order. 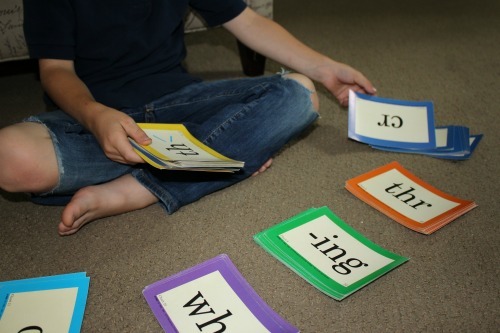 Most of my flashcards are classroom quality, as opposed to the cheapos found at Walmart or Target, so they were very easy to resort. 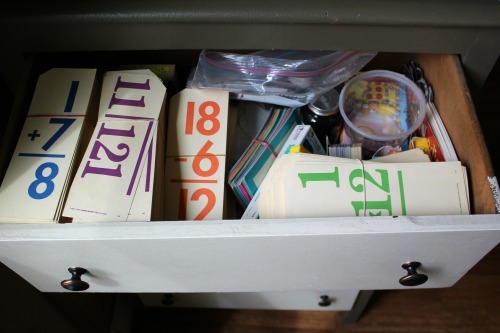 Here is the same drawer AFTER it was organized and cleaned. In only a few hours time over the course of two mornings, I had all of our main school spaces ready for another year of learning. I know they won't stay picture-worthy for very long. And to be honest, I don't always have the emotional bandwidth to even care. 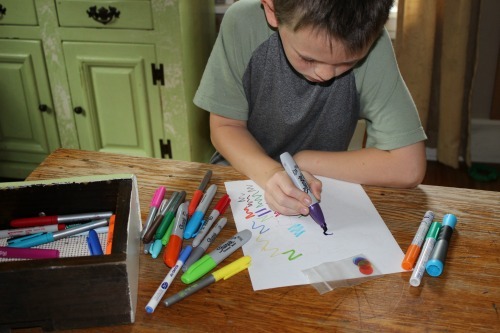 But for now, I'll enjoy a slightly cleaner home as I make my back-to-homeschool shopping list and plan a fun-filled first day! To see my reorganization in real time, check out my "School" highlight on Instastories. My hutch is already to go too. It feels good start fresh. That seems to always happen to me too. Or I put everything in order towards the end of summer, but by fall, I find that it's gotten out of order again. I think Blogger is having issues with its comment section. Sorry about that. We found ours at a thrift store. With a little bit of elbow grease and some paint, it shined up nicely. Any cabinet will do.